Oops - we don't appear to have a video for the ScanMate i940M. Unmistakably easy. Remarkably powerful. Highly portable. Introducing the Kodak ScanMate i940 Scanner for Macintosh Computers. 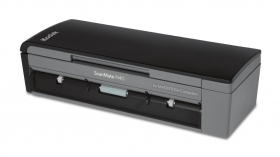 In your office or on the go, you need a scanner that combines super ease of use and portability. With the Kodak ScanMate i940 for the Mac, that's exactly what you get. Thanks to its light weight, small footprint, and USB-powered option, it's easy to collect, manage, and distribute information from anywhere – whether you're in the office, at the coffee shop, or attending a conference abroad. And when it comes to managing scanned information, nothing makes it easier. The i940 for Mac seamlessly integrates with the NewSoft Presto! PageManager document management and filing solution, so you'll be able to easily scan, OCR, create, view, edit, annotate, and append to PDF files. And because it combines new scans with your existing documents, you'll have everything at your fingertips. Take your business anywhere with the Kodak ScanMate i940 for Mac.